Another day, another jalapeño in the salsa of Food With Integrity spin from Chipotle. After their recent decision to source grass-fed beef from Australia, citing a lack of supply from US ranchers; Texas Agriculture Commissioner Staples yesterday praised Chipotle for their willingness to discuss the matter. 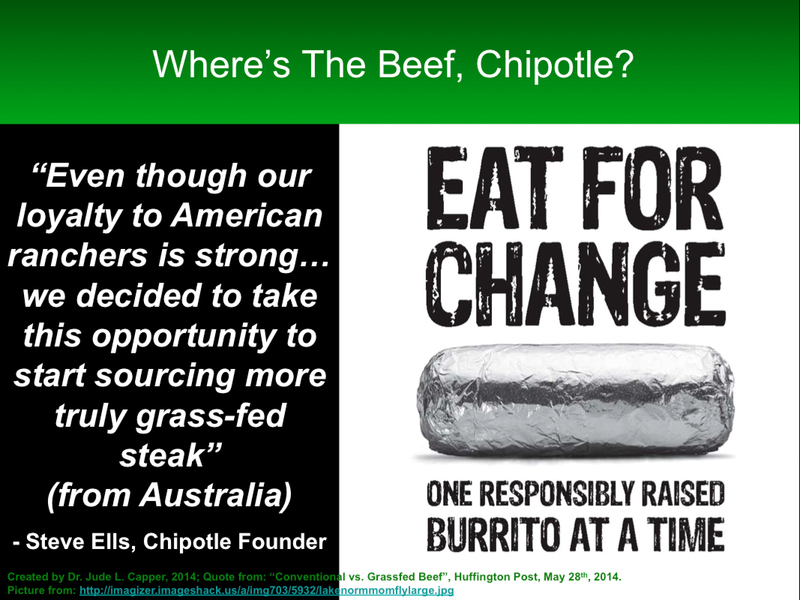 Yet in a world where companies can be made or broken by PR, the likelihood of Chipotle Chairman Steve Ells responding to Staples’ queries regarding their beef choices with “Our mind is made up, we’re not prepared to discuss it further.” was highly unlikely. Instead, their defensive response to Staples simply stated that they were happy to engage in dialogue. Dialogue is great, but note that it doesn’t actually mean that any decisions will change. After all, I’m happy to dialogue with opponents of GMO crops and vaccines, but have any of those discussions made me change my stance on the safety, efficacy and importance of these technologies? No. Rather than being applauded for their willingness to debate, Chipotle should instead be questioned about the apparent incompatibility between their Food With Integrity slogan, and their beef choices. As stated in the response to Staples, Chipotle only uses 23% of the beef on a carcass, relying on other buyers to provide a market for the remainder. Yet as we strive to feed an ever-increasing population using fewer resources and with less waste, wouldn’t it be more sustainable for Chipotle aim to use as much of each carcass as possible? After all, authentic Mexican food uses many different cuts, organs and variety meats – shouldn’t Food With Integrity derive more than chips and salsa from its supposed region of origin? As discussed by California ranchers here, the issue appears not to be related to a scarcity of US beef per se, but rather beef at a price that Chipotle wants to pay. 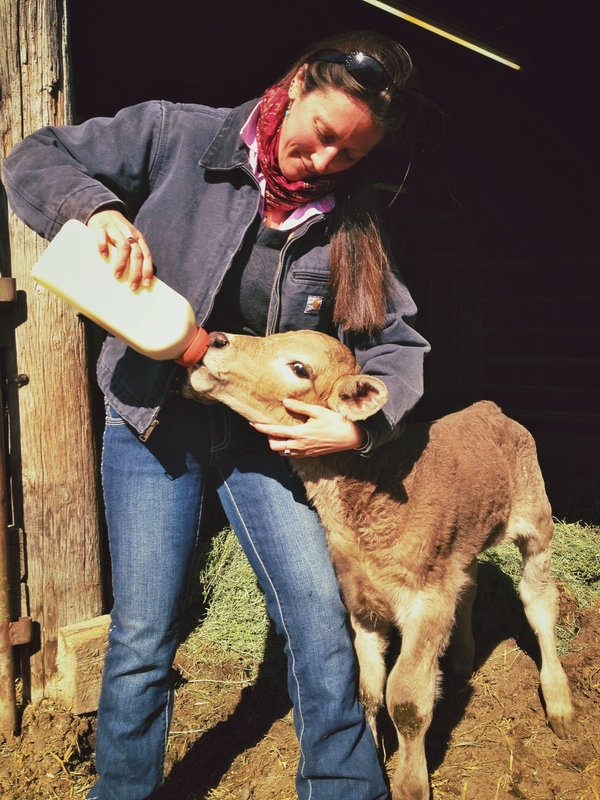 Given their claims of support for US beef producers, paying grass-fed ranchers the premium that they need for their production systems to be economically viable would show more integrity than importing beef from overseas. Ranchers should not be expected to operate at a loss for the privilege of supplying Chipotle with a premium product, of which three-quarters will be discarded. 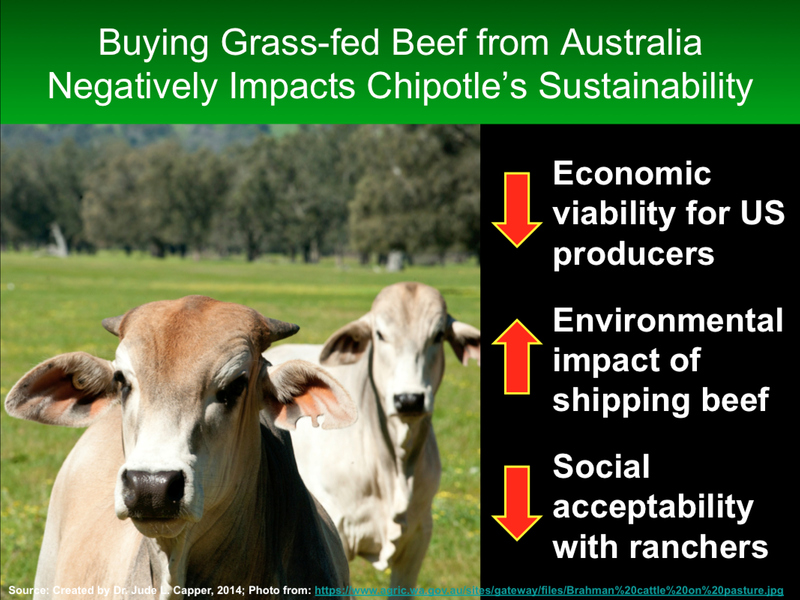 Reduced social acceptability for Chipotle’s brand within the agriculture industry. Planning to eat at Chipotle this weekend? I’m willing to bet you’re not a US beef producer.